Stop stressing about running out of battery on your smartphone with this portable Apple Original Home Charger for iPhone 5, 5s, 5c, 6, or 6S. With a separate AC adapter and USB cord, this versatile charger is a reassuring companion whether you're on a trip or just out for the night. Please note: This is compatible with the iPhone 7. Not compatible with the Air models. 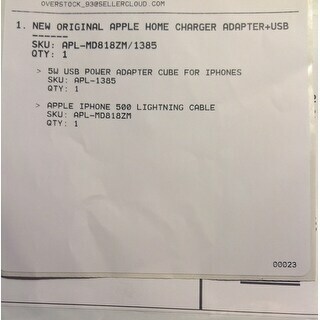 Apple Original Home Charger Adapter+USB Cable for iPhone 5/5s/5c, 6/6S is perfect! 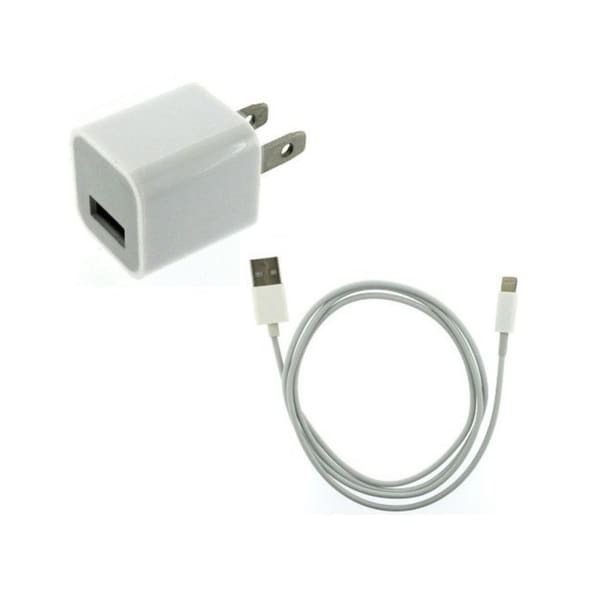 This is an a real Apple Home Charger adapter that works great with both my iPhone and iPad. I bought this after buying an adapter cable elsewhere that claimed to work with my Apple products. Wrong. Thank you Overstock, for having real Apple products. I purchased this Apple Iphone charger for my 6se phone so i can leave it at my moms house when i go to visit.I have on one visit left my phone charging or needed a charge before i left..Now i will have this extra one there so i will not have to remember to pack it..This is a original Apple charger great price i wasn't going to pay a large amount for a extra one so this worked out great for me..Apple is a great product and now i have the peace of mind to know i can keep the phone fully charged there or here at home. Thank you overstock! 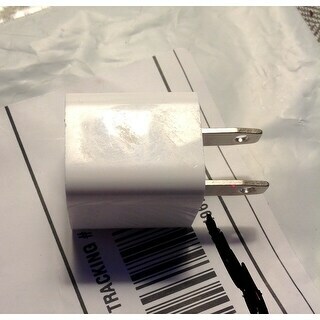 I had been needing to buy an Apple Charger for awhile now, but did not want to pay $30.00 for one. Since I needed two - one for me and one for my son - I definitely did not want to spend $60.00 for 2 chargers. I just so happened to see an ad for Overstock.com and checked their website and to my surprise they had Original Apple chargers for only $15.98!!! Not only did I buy 2 chargers, I also bought 2 Original Earpod Headphones for both of my sons for Christmas!! They both were so happy when they opened them on Christmas Day because they had been wanting them for months and I wanted to get them original Apple products. So THANK YOU Overstock.com for helping me to put a smile on both of my sons face for Christmas!! I'm overall happy with this order. It came in the mail within 3 days and works very nicely and charges my phone very fast actually! I will say it was a little annoying because at first I used the box and the USB that came with it, plugged it in, it wouldn't work. I switched out the box, plugged in the USB cable, and it worked fine. I then plugged the USB cable back into the original box that came with the order and it worked. That was strange, but all that matters is the USB cable worked! Great product just like the adapter that came with my phone. The whole reason I bought this item here was because it was listed as "new" on the website and on my packing slip but it is far from new. The plug adapter is worn with scratches and little nicks all over it. If I knew it was used I would have just bought it from Amazon and got free 2 day shipping instead of paying for shipping and waiting over a week. I have no idea if it even works yet. Very disappointed and I feel like it was false advertising. I gave it 2 stars, simply because the cord looks new but who knows. The first charger that was sent with my iphone was not by apple and it worked about half the time until it would hardly ever work. It would say: "This accessory may not be compatible"...and it wasn't! It is not a apple certified charger but it does charge. Dont buy it. Within two months, it has started giving issues. Doesnt charge my phone anymore. Didn't read the description properly so I was a little disappointed when I realized the cord was so short. I love that this is an Apple charging cord, but would really appreciate if they would make it longer... this would be super useful to those of us who want/need to charge while using the devise. Thanks! Received very quick! They are just like my original! Very happy... will order from overstock from again. This was exactly what I needed for my phone. It works fine so I have no issues and would recommend it for the price and fast shipping. I’m sure this will not be the last time i purchase these charges....... the price is perfect I was able to put one in each room of my house. Great value!! Nice long length. Worked great at a great price. This charger is great quality and is a fast charger. My son said it charges faster than the one he has. Great buy! Exactly what I was looking for! Great price and Apple certified. "Is this a truly original Apple product?" Yes, I hope it helps. "Is this compatible with an iPhone 7?" Yes, this cable is for iPhone 6, 6s, 6plus, 5, 5c, 7s, SE, iPad, iPod. "Is this cable compatible with iPhone 8s and 10s?" "Is this a genuine Apple product?" Yes, it is an Apple product and it works just fine. "Can I use this charger for my apple IPhone 6 Plus?" "Is this made by Apple?" yes- works perfectly with my iPhone. "Can this be used with an iPhone 7?" This is for iPhone 5, 5s, 5c, 6 and 6s only. It will work for an phone with a lightning connector -- which includes iPhones 5 through iPhone X. Stay connected to loved ones with a new smartphone this Christmas. Check out our list of the best smartphones for Christmas to help you find the perfect gift.